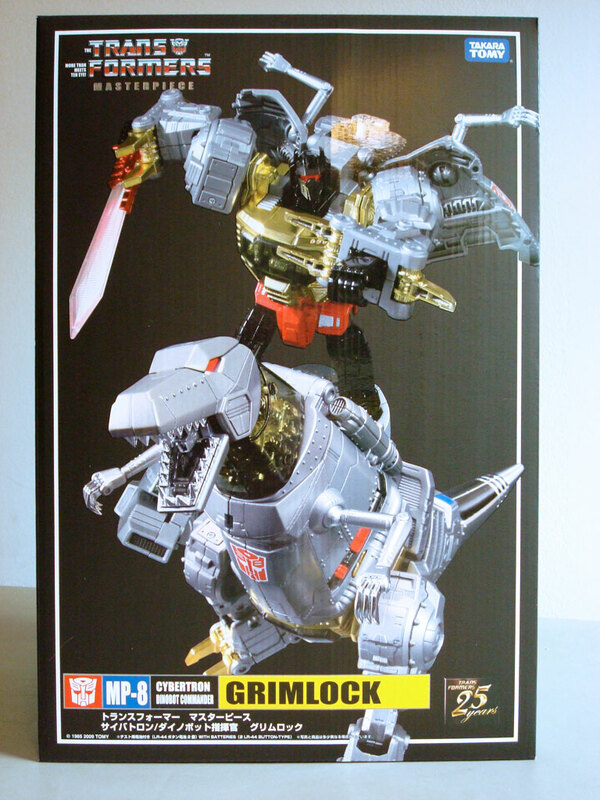 Grimlock comes in the now familiar Masterpiece box. 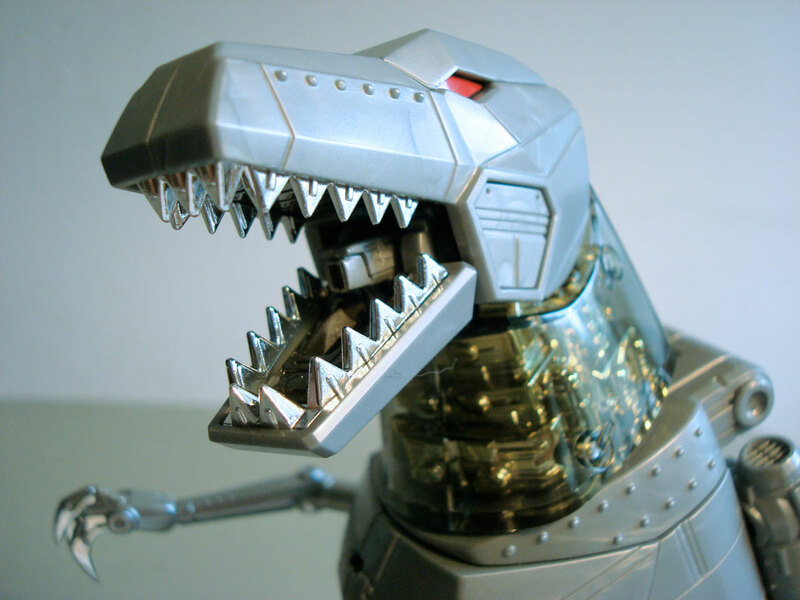 The front shows off the character in both robot and dino-modes against a rich black background. The back of the box displays the many accessories and gimmicks you can expect from the toy within. The main thing you will notice is how thick the box is in comparison to the other Masterpiece toys — it’s almost twice the depth of MP-05 Megatron, the 2nd thickest box. 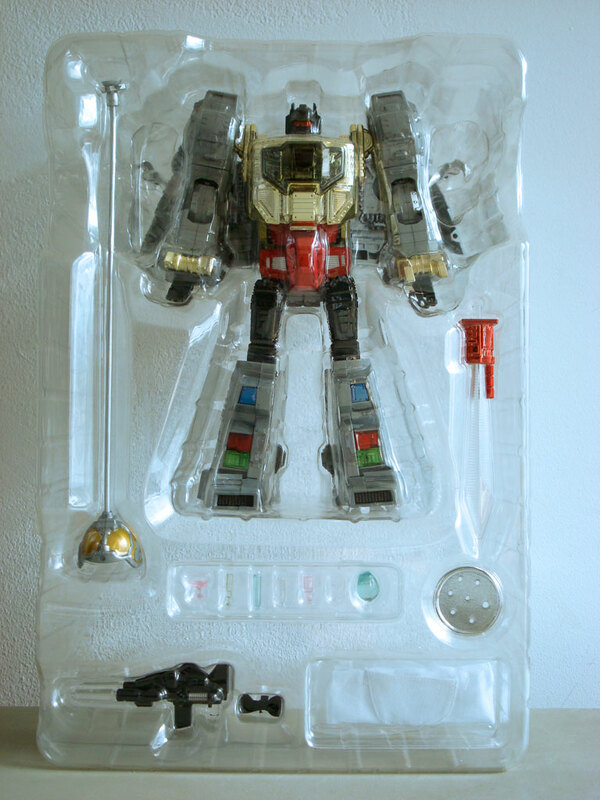 When you open the box (single tape enclosure on the top and bottom), you slide out a plastic tray in which Grimlock and his accessories reside. Grimlock is packaged in his robot mode. 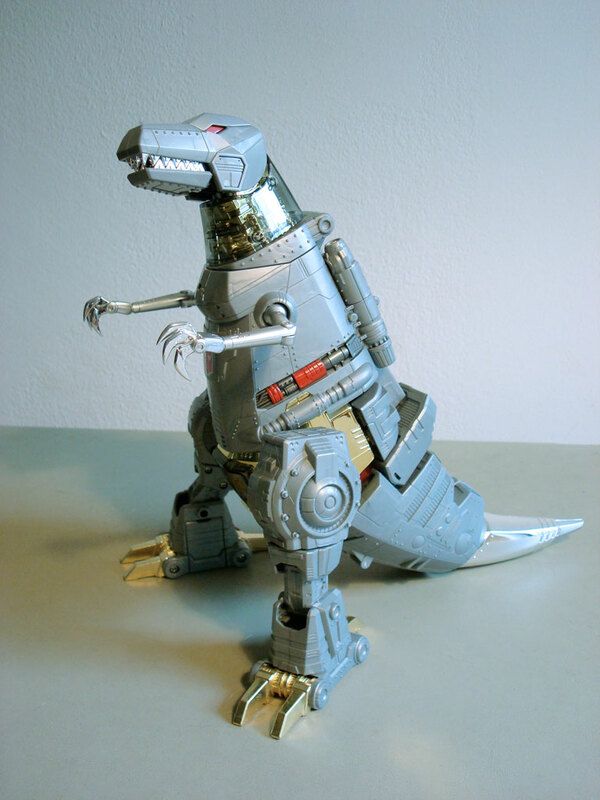 Grimlock feels solid and sturdy; his die-cast metal parts (dinosaur feet) add a nice balance. His joints are tight and stable and there is no fear of accidentally snapping or breaking a piece off. 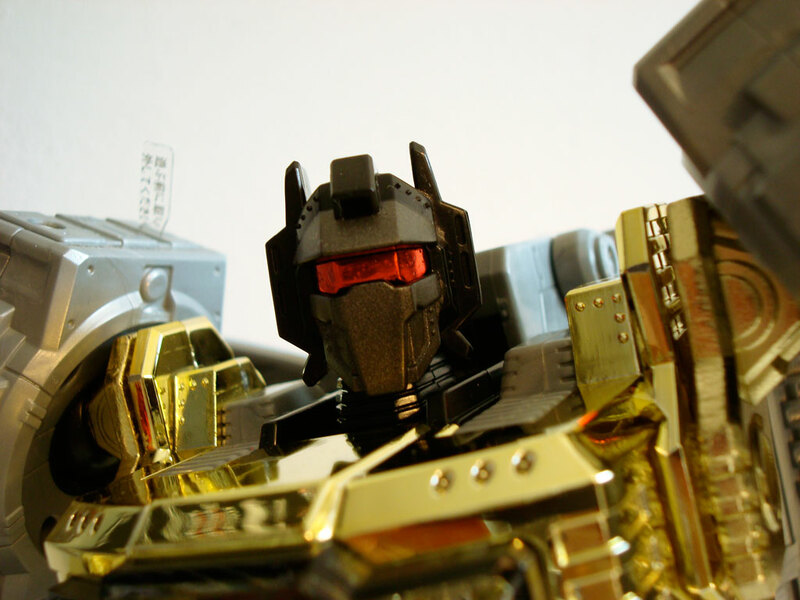 His chest is covered with vac-metallized gold. He displays a wide range of articulation allowing for any number of cool poses. His head and shoulders are on ball joints, his elbows can twist and bend, his wrists can rotate and his thumbs are on ball-joints. His hips can tilt up and down, his thighs rotate, his knees bend and his feet have some yaw mobility to allow him stand on level surfaces. 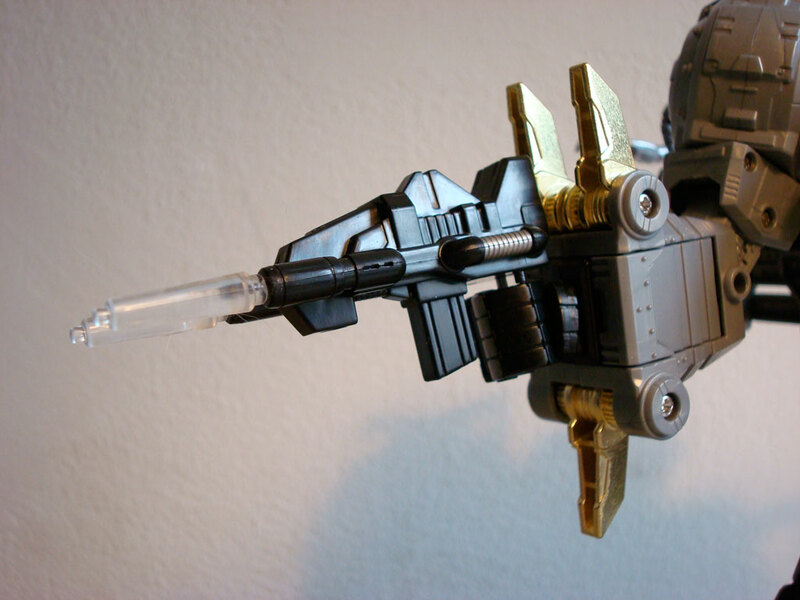 In this mode, Grimlock has two weapons as options: his Energo sword and his twin stunner rifle. Both can plug into his right hand, which leads to our first gimmick. On his right shoulder is a tab, that once removed, allows the user to push a button on the back of the same shoulder. 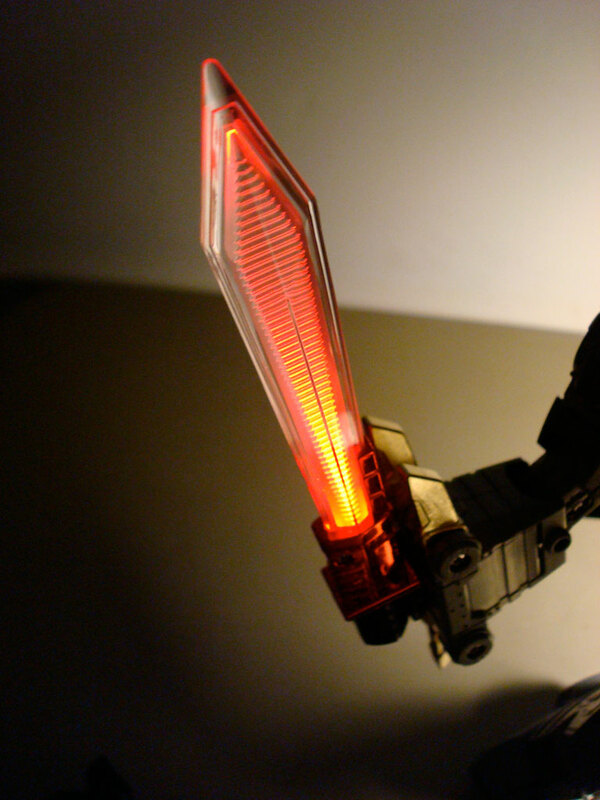 This activates a light-up feature that illuminates the blade of the sword and the barrels of the rifle. The second gimmick of his robot mode involves changing his visor color. 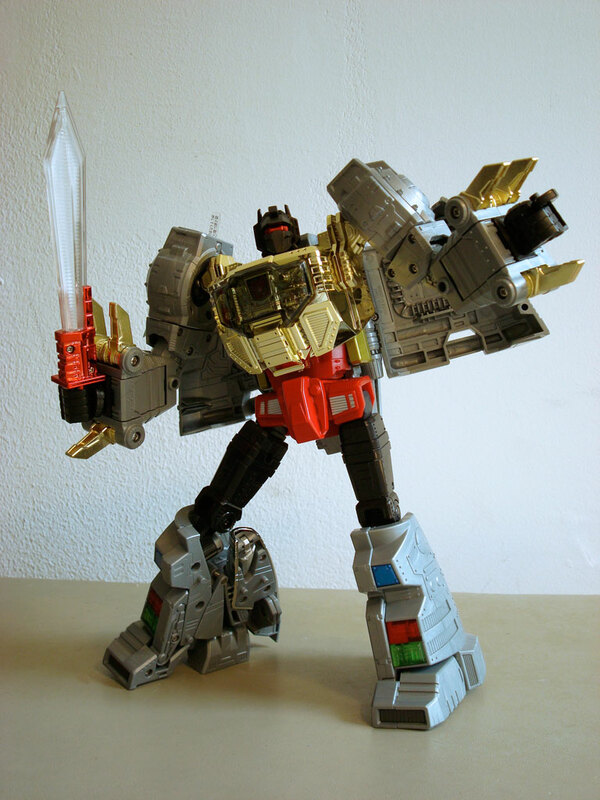 Normally, Grimlock’s visor color is blue, tipping us off to his allegiance with the Autobots. However, an unobtrusive lever on the back of his head allows you to flip a red visor over the blue one; this allows you to recreate the television episode in which Grimlock turned evil. The designers at Takara display much ingenuity in translating the transformation scheme from the G1 version to this version. They manage to make it complex enough that it is not a direct 1-to-1 translation though it is close enough to feel familiar. 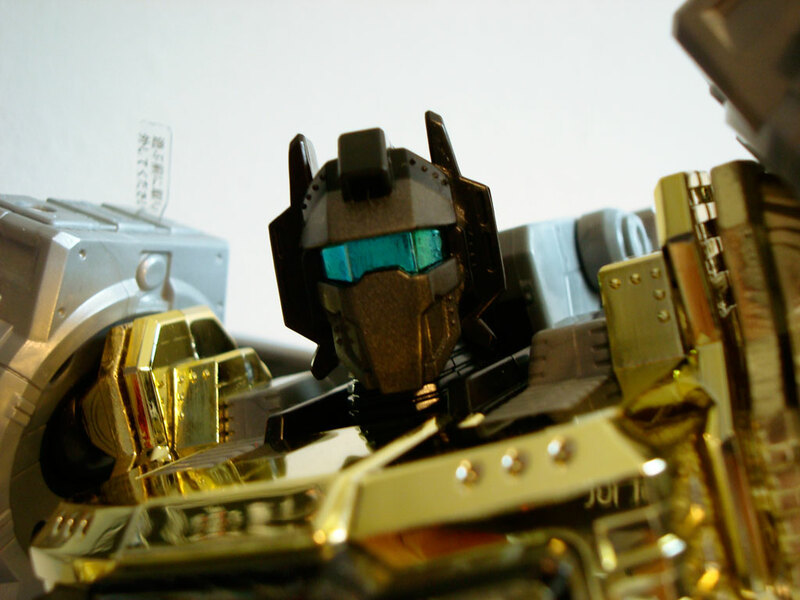 Grimlock’s alt mode is a fantastic and mostly seamless appearance. A minor quibble is how wide his body is, but it’s only very apparent when looking at the dino-mode head on. In this mode, his teeth, claws and tail-end are vac-metallized silver. His dinosaur arms have a ball joint at the shoulder and only bend at the elbow. Also, the three claws on each hand can move independently of each other. It is in this mode that the majority of the added play-value gimmicks occur. You can change his eye-color from blue to red by flipping open his cranium to rotate the piece that allows this. His mouth his hinged so you can open his jaws and close them either manually or by pressing a button on his left cheek. 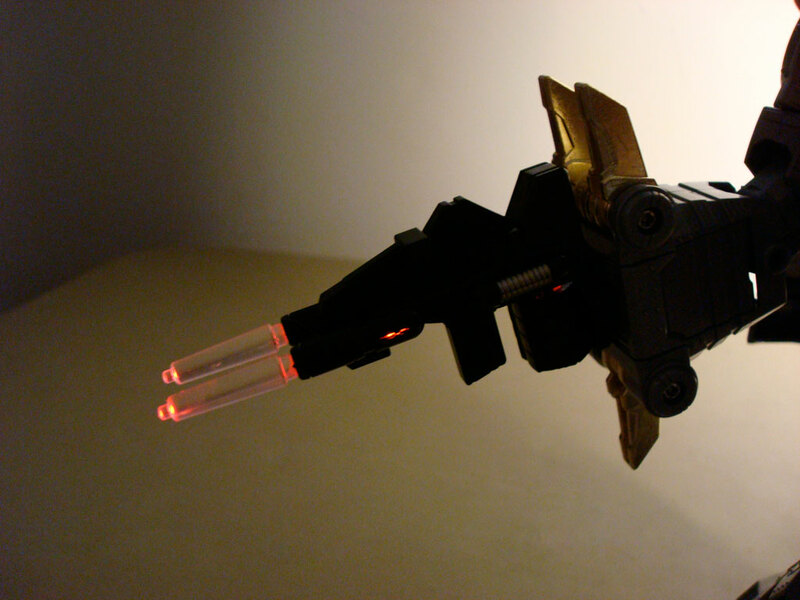 Inside his mouth you can also find a small laser cannon that can tilt up and down. If you move his tail from side to side, it swivels the head in opposite directions. The tip of his tail can also swivel left to right independently of the whole tail. 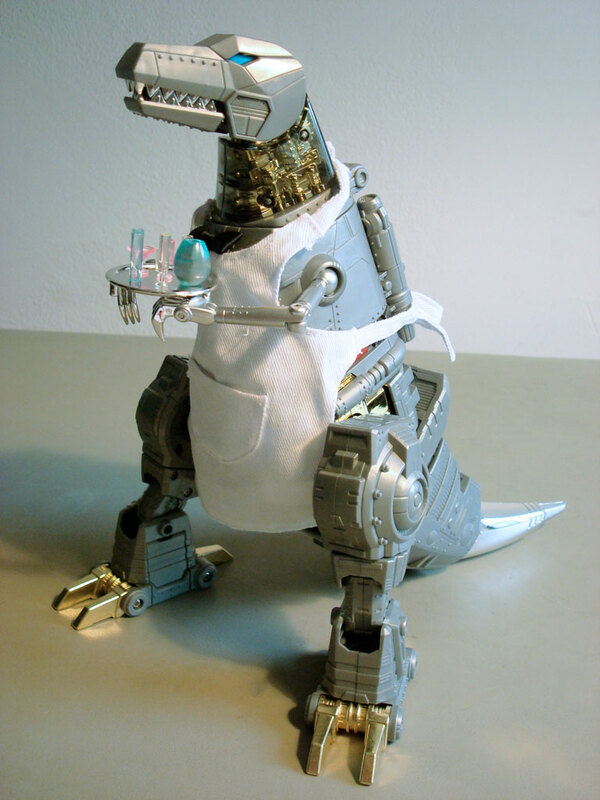 The lion’s share of accessories also revolve around his dino-mode, and all come from scenes from the animated tv show. From the episode “Madman’s Paradise” you can insert a black bow-tie into a small slot in his upper chest; you can also tie an apron around him (clasped at the neck and around the waist by velcro strips) and place over his claws a serving tray pegged with an assortment of glasses. 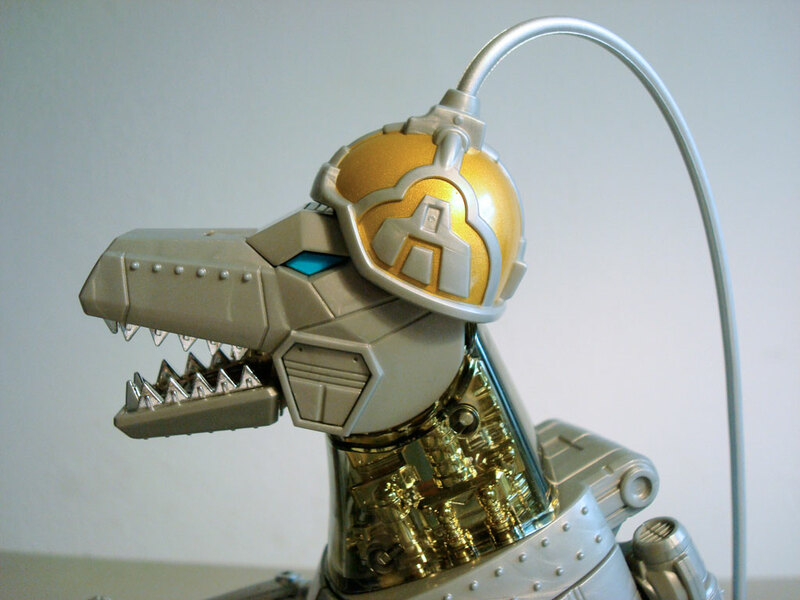 From “Grimlock’s New Brain” comes the intelligence transfer device — a helmet that goes over his dino-head from which a tube leads to the corresponding transfer end. Now all we need would be a Masterpiece edition Computron to be on the receiving end! Overall, I am very impressed with this figure. This Masterpiece edition continues the strong run of Transformers at a larger scale and successfully translates the G1 character into a well-detailed and articulated figure in both robot and dinosaur modes. The many accessories and gimmicks further heighten the pleasure that comes with owning this amazing toy. I eagerly await the next Masterpiece character (Soundwave? More Dinobots?) while I enjoy playing and displaying Grimlock.